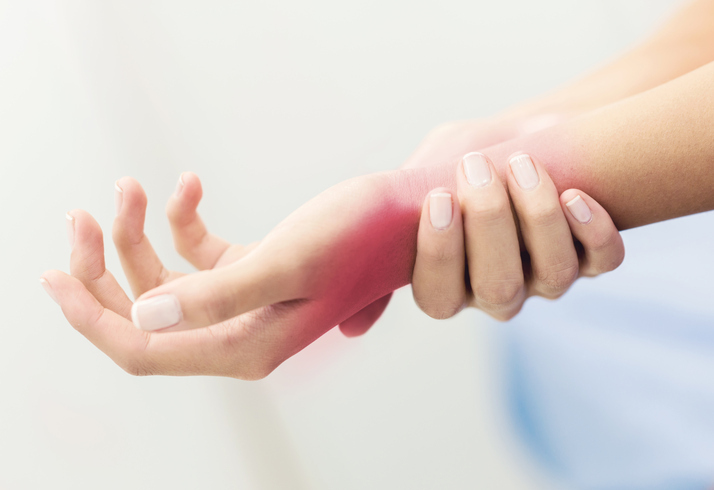 The carpal tunnel is a narrow channel in the hand made up of the small wrist bones and the overarching connective tissue. A few structures pass through this tunnel for example, the median nerve, the finger flexor tendons and the blood vessels. CTS occurs because the median nerve gets squashed, often due to a build-up of fluid and swelling. This can lead to numbness, tingling and sometimes pain in the fingers and hand, and occasionally in the forearm. There can also be associated weakness in the hand. Wrist injuries and repetitive movements of the arms, wrists or hands can bring on CTS. Pregnancy can also trigger this condition due to an increase in fluid retention. Tests can be carried out by an appropriate healthcare professional, such as a physiotherapist, to diagnose CTS. Nerve conduction studies may be needed which would require a referral to an orthopaedic consultant or rheumatologist. Treatment can include wrist immobilisation in a splint to reduce nerve compression, and can be particularly helpful when worn at night. Physiotherapeutic input can also be helpful. Patients may be offered anti-inflammatory drugs or injections of cortisone (steroi) to reduce swelling by a consultant. Injections may only provide temporary relief and are most appropriate for those who have CTS due to an acute onset of tenosynovitis (an inflammation of the tendon sheath). If there is no positive response to conservative treatment, then surgery may be the next option to relieve the pressure in this region. This is often followed by physiotherapy to ensure that a full recovery is made and normal movement and strength is restored. If you are having any symptoms discussed above and you would like to come and see one of us, call us on 020 7183 4436.